Last week I let my roommate borrow my coveted dupe for Chanel’s Black Pearl nail polish, which she was very excited about. But she wasn’t as excited when, much to her dismay, she started noticing chipping in just a few days. This got me thinking about how many girls are faced with this problem. I mean, how frustrating is it to spend money on an awesome manicure with a great color, only to have the polish chip off in two days? Not cool. So, to help you avoid this, I’m going to offer you a few of my personal tips for maintaining your manicures (and pedicures), and keeping them chip-free for longer! 1. Keep them short and shaped! I am very particular about my nail shape and that’s the main reason that I tend to do my own nails versus getting them done at a nail salon – it’s also part of the reason my nail polish stays on longer than my friends’. I’m a personal fan of the “soft square” shape for my nails, which has a squared off end with rounded, smooth edges. I seriously believe this shape is a key reason why my manicures last – in a smooth, square shape, my nails are less likely to catch on anything and bend or break. I also like to keep my nails short – I don’t like them going beyond my fingertip. Having shorter nails will help maintain your mani because they will be less susceptible to overt damage from the outside world! They won’t hit keys as you type (a frequent chip culprit for me), or bang into things, and will generally be more out-of-the way and safe from potential hazards. 2. Top your nails off with a top coat (daily)! This might be the most important tip that you’re going to read today! You know how when you go get a manicure, the manicurist always applies a clear top coat to the nails after your color? Well, there’s a reason for this and it’s a very important one! A clear coat is the main barrier protecting your polish from chipping and cracking. To keep the salon look perfect, my personal suggestion is to do a clear coat on your nails every day throughout the duration of your manicure. I know that sounds like a lot, but if you buy a quick-dry one, it’s really not a big deal! 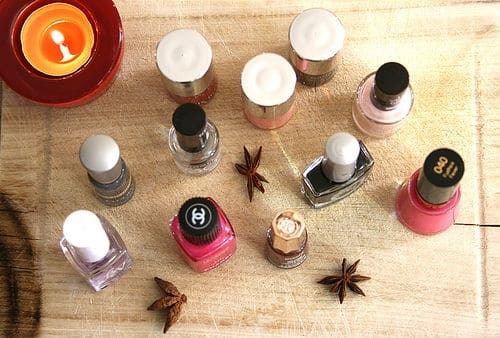 That alone won’t save your manicure, though: you need to apply it the right way! Typically, you should do one swipe of top coat across the tips of your nails, and then do the rest of the nail. Why? Because nails always chip at the tips first, so that area needs extra protection! As a side note, base coats also make a world of a difference because they mean the colored polish isn’t just clinging to your nail, instead it sticks to another polish which really makes it last longer in my experience. 3. Make friends with your nail buffer! I’m convinced that nail buffers were put on this planet by the nail gods to make girls’ lives easier – these things are magical! While I never go more than an hour without nail polish on my nails (by now you guys should know I’m a polish addict), I always buff my nails in between polish changes. The whole buffing process makes your nails primed and ready to accept a new polish. Ultimately, your polish will adhere better, and last longer if you have smoothed, buffed, and polished your nails. I do this every time I give myself a manicure and it makes a world of a difference. Give it a try and see how it works for you! Don’t feel like doing all these things? If you’d rather have a lower-maintenance manicure, give shellac manicures or soak-off gel polishes a try! I actually have yet to try this new phenomenon, but I’m definitely excited to. Fans say that shellac manicures and soak-off gel polishes are drastically less prone to chipping, can last for weeks, and dry immediately once they’re put under UV (or LED) lights. Of course, they’re a little bit pricier at the salon than your standard manicure and require a bit of a process to remove, but it may very well be worth it if they can simplify our lives and routines. Fair warning, though – the color options are pretty limited compared to regular polish! Do you currently use these techniques? Are there other manicure-saving techniques that you use? Have you tried the shellac manicure yet? Let me know your thoughts in the comments below!